Shelti makes a good foosball table hands down. 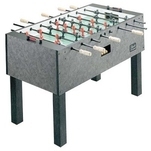 Its an American made brand with an American style of foosball that gives this table a high performance. Though this is not their top of the line table, you can save some money and still have most of the features of a good quality table in the Pro Foos 1. It offers wooden handles, foosball men with a pointed toe design that allow for complex foosball shots, and a solid play surface. This foosball table is priced at around $1,050 US.